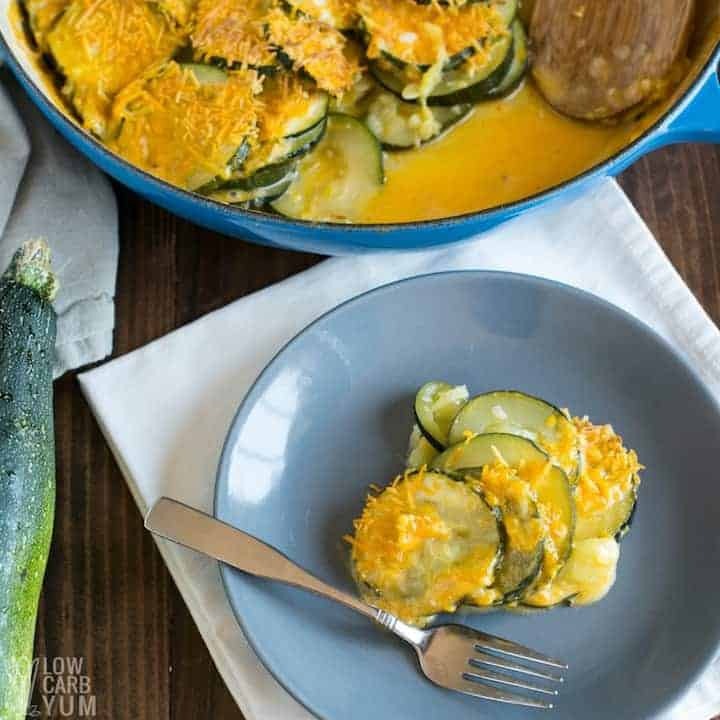 An easy zucchini gratin recipe that’s keto friendly and takes just minutes to prepare. 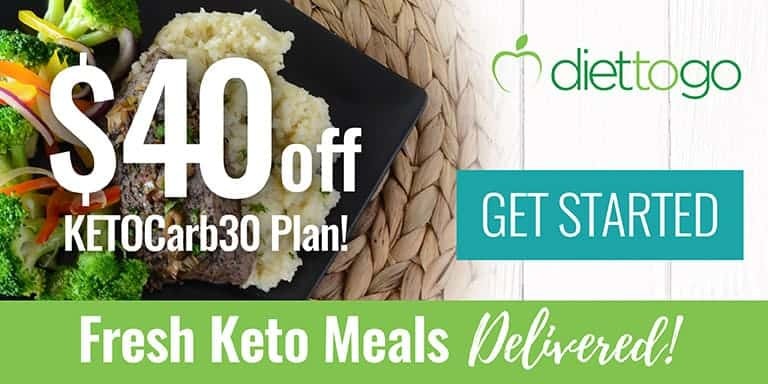 It’s a healthier alternative to the high carb au gratin recipes. 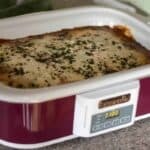 Isn’t saying low-carb gratin kind of an oxymoron? After all, the traditional au gratin dish is topped with breadcrumbs, along with cheese and cooked covered until perfectly golden brown. Now, when most people think of au gratin, the dish that comes to mind is potatoes. But potatoes, in my opinion, are at the top of the list for being one of vegetables to avoid. That’s because the starch from potatoes can rapidly metabolize into sugar. 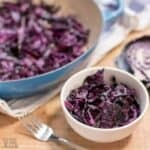 And for people such as myself who have decided to follow a low-sugar/low-starch diet (I had my thyroid removed and can put weight on easily; read more about me here), potatoes should definitely be avoided as much as possible. But I’m here to tell you that it’s not necessary to make a traditional-tasting au gratin dish with potatoes. 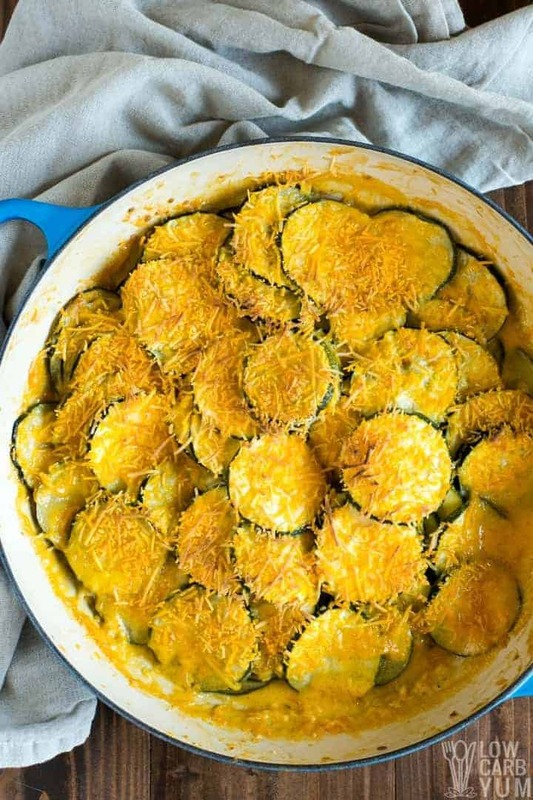 Just sub it out for a healthier veggie like I do in this zucchini gratin. When replacing potatoes with a low-starch veggie, it sometimes help to partially cook the veggie first. And then, you can bake the low-starch veggie in the au gratin pan. But before I show you the exact steps for the recipe, I’d like to talk (type) briefly about why I love cooking with this specific veggie. I guess you could say I’ve been on a zucchini tear as of late. Turkey Zucchini meatballs? Check. 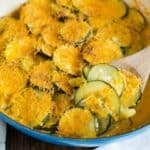 Zucchini nachos? Nailed it. Zuke Philly Cheese Steak Boats? You gotta see it to believe it (and then taste it). I’ve also transformed the nutrient-dense, low-calorie veggie into a healthier french fry, pizza slices, and cheese wedges. 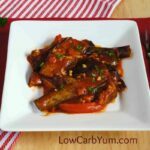 And I’ve of course created several low-carb pasta recipes with it using zoodles. 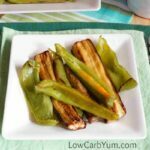 If you’re following a ketogenic lifestyle, it’s definitely one of the best low-carb veggies for a keto diet. So without further ado, let’s get cooking…. And last but not least, 2 medium zucchinis sliced. To make it, the first thing you need to do is in an oven-proof skillet, over medium heat, melt the butter. Then, add the garlic and onion and cook until you see that golden brown color (photos 1 & 2). At this point, you’ll want to add the almond milk (or cream). Place on simmer and continue to let it cook until it starts to boil (photo 3). Do not turn the stove top off just yet. At this point, you’ll want to delicately and slowly add half the shredded cheese and stir until it melts (photos 4 & 5). 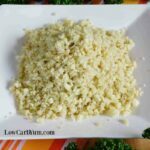 Since my family has been avoiding dairy, I used non-dairy cheese shreds. Next, stir in the veggie (photos 6 & 7). All the slices should be soaked and covered in the sauce. Stir frequently and cook on simmer setting for another 5 minutes. Now it’s time to add the rest of the cheese (photo 8). 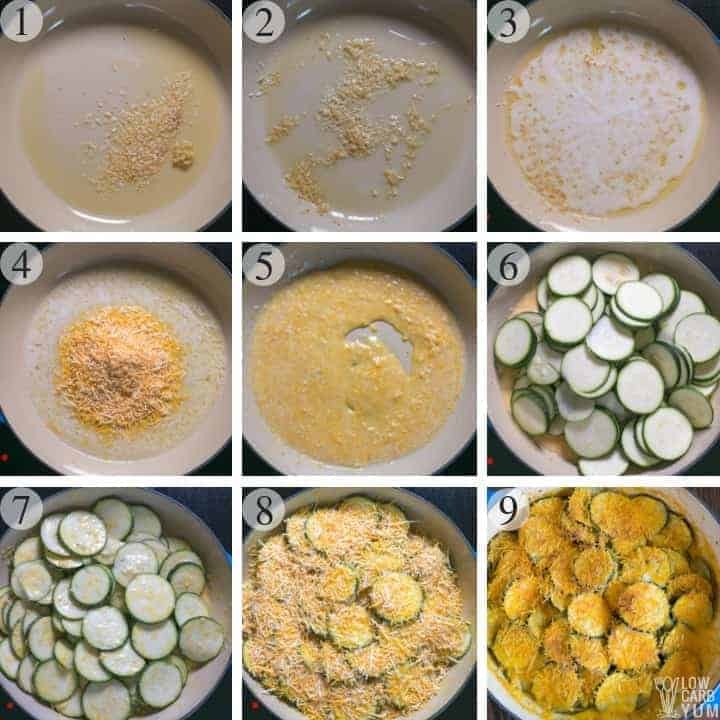 And the final step in preparing this zucchini gratin is baking it in the oven at 400 for about 20 minutes until the top is browned (photo 9). Oh yeah, and one more thing: enjoy! The reason I mention above that I’m interested in hearing from you if you’re using a vegan cheese substitute is I tried it myself. And I have to be honest here, it didn’t turn out so well. I found that the dairy-free cheese didn’t melt well in the oven. I’m going to research how to hack that but I’m curious if you have any solutions. I’m not dairy-free but I do try to reduce my inflammatory load as much as possible. 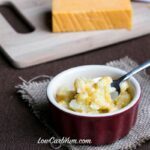 Organic cheese is probably fine to eat once in a while; I don’t really feel any bloating or other symptoms of inflammation if I keep my cheese intake to a minimum. 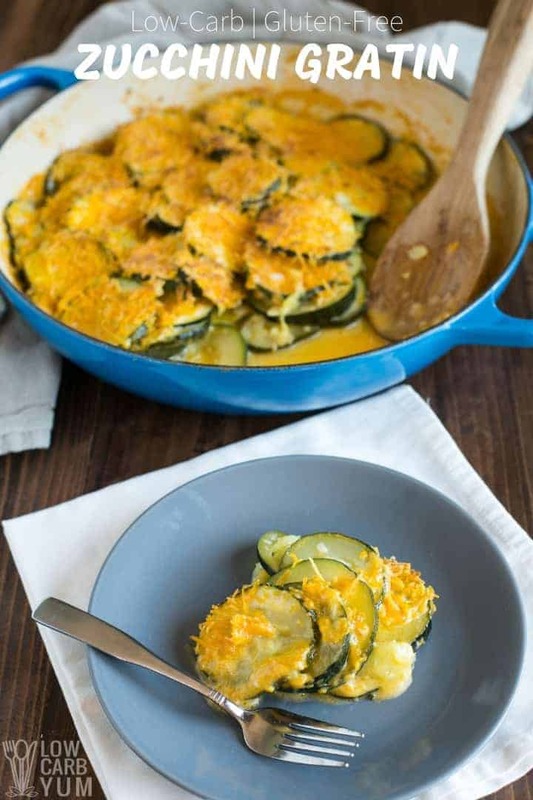 But the great thing about this zucchini gratin dish is it’s gluten-free. I suppose I could try to use gluten-free breadcrumbs to make it more of an authentic style dish. 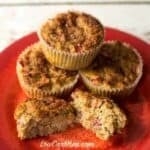 However, just because breadcrumbs are gluten-free does not mean they’re free of inflammation-inducing carbs. 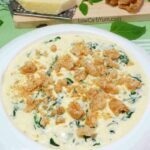 Have you ever made a variation of this dish? I’d love to hear how you prepared it. Please share your experience in a comment below. 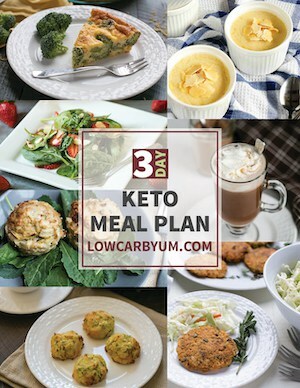 An easy gratin recipe that's keto friendly and takes just minutes to prepare. 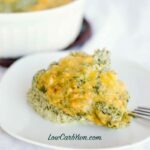 It's a healthier alternative to the high carb potato au gratin recipes. In oven proof skillet over medium heat, melt the butter. Then add the garlic and onion and cook until browned and fragrant. Add the almond milk (or cream) and simmer until it starts to boil. Slowly add in 1 cup of the shredded cheese and stir until melted. 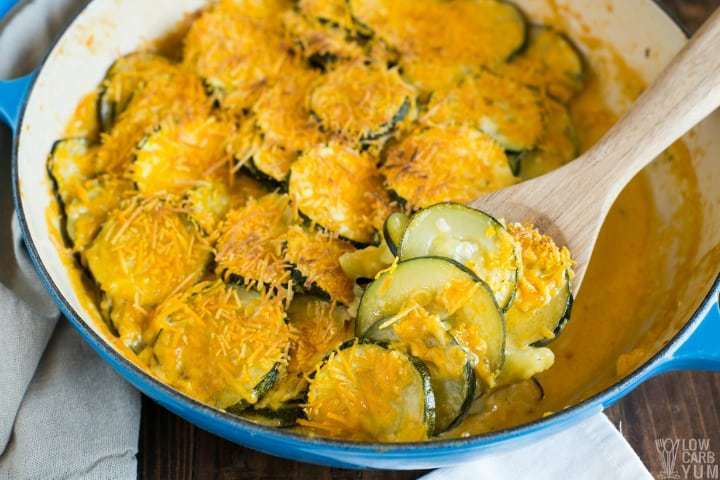 Stir in the sliced zucchini until all are covered with the sauce. Stir and cook for another 5 minutes. Sprinkle remaining 1 cup of cheddar cheese on top. Then bake in 400°F oven until top is browned (about 20 minutes). I used dairy free cheese which didn't melt well in the oven. Real cheese should melt and get gooey while baking.